Think about the last time you saw an advertisement online. Was it a pleasant experience? Did you enjoy it? If you’re part of the vast majority of people browsing online, then your answer is probably a cold, hard NO. Consumers have become highly sensitive to online and mobile advertising, to the point of adopting ad blockers, such as the well-known software, Adblock Plus. According to SocialTimes, as of 2014, more than 15% of internet users in the U.S. were using ad blocking software. That number is projected to soar above 26% by 2017. That is, over 1 in 4 people will be using some form of ad blocker. To make matters worse, Apple announced in 2015 that its operating system, i0S9, would support Safari ad blocking. In turn, this lead to tons of mobile ad blockers flooding the Apple App Store. First, the good news. According to Bizibl, ad blocking software often prevents the browser from requesting the ad in the first place. So if your ad is blocked, more often than not it won’t cost you those valuable impressions. And now for the bad news. Ad blocking means increased prices for the same ads and longer campaign runtime. Based on estimated projections made in a report published by PageFair and Adobe, the global cost of lost revenue due to ad blocking in 2016 amounted to over $41B. What can a marketer to do to fight back? According to DigiDay, the way out might be up. The new age of ad blockers is a wake-up call to advertisers to start creating better, more informative, and highly targeted (read: relevant) advertisements. Across all platforms, including social media, tv, and radio, relevancy is becoming increasingly important. Become a true advocate for your customer and create advertisements worth noticing, rather than pushing clickbait copy, intrusive pop-ups, and data-sucking ads. Everyone wins here. You get to reach a more targeted audience that might actually click on your ads, and the consumers won't hate you for tricking them or annoying them with irrelevant clutter. This West Elm ad featured on apartmenttherapy.com is well-suited for the website's visitors. It's straight-forward, visually appealing, non-intrusive, and supplemental. Google, who owns the largest ad exchange and ad server, may start having higher standards of approval. If this becomes the case, then Facebook ads, which also go through an approval period, might step up their standards, as well. This might sound counterintuitive at this point, but Adblock Plus and other ad blockers currently aren’t blocking social media feed advertisements, such as Facebook, Twitter, Instagram, etc. Social media advertising is an opportunity to be highly relevant, creative, and versatile because anything else simply won’t perform the way you’d like or need it to. Become well-versed in the most effective strategies around each social media platform and capitalize on the infinite scrolling of your consumers. Some tips include using short, compelling videos for Facebook and high-quality, brand-centric images for Instagram (think: anything but stock images). Your strategy around social media should enhance the perception that consumers have of your brand - while also selling your product. More than ever, social media has become a place to tell your story in hopes of converting your target market into brand advocates. Get to know the feeds of those you’re targeting and create advertisements that look so natural and native that people scrolling their feeds won't even realize they're looking at an ad. 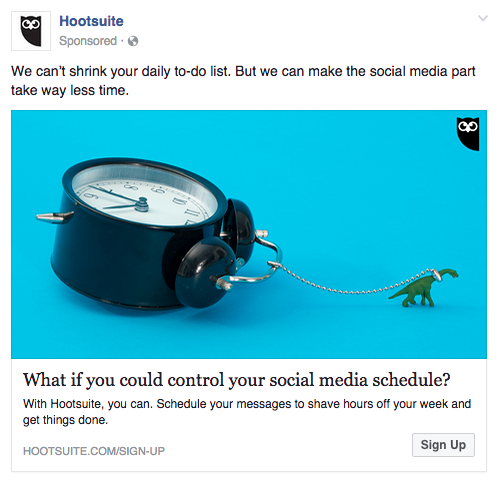 This sponsored Hootsuite ad, for example, fits right in the rest of this user's Facebook news feed. It's also highly targeted, so they're probably already used to seeing similar content on their feed. If you’re a publisher, you probably rely heavily on advertising revenue. Offering a subscription option that removes or heavily decreases the number of advertisements, much like Spotify or Hulu, can be your saving grace. According to a 2015 UK report published by Reuters, only 6% of people claim to pay for online news content. If more and more popular news outlets pick up the trend, then this number is expected to rise sharply. With paywalls, the ad clutter is reduced significantly and the ads on the page are usually highly-targeted to the site's audience. If you're a publisher, you get revenue from subscriptions and you get to provide your visitors with a more positive experience. 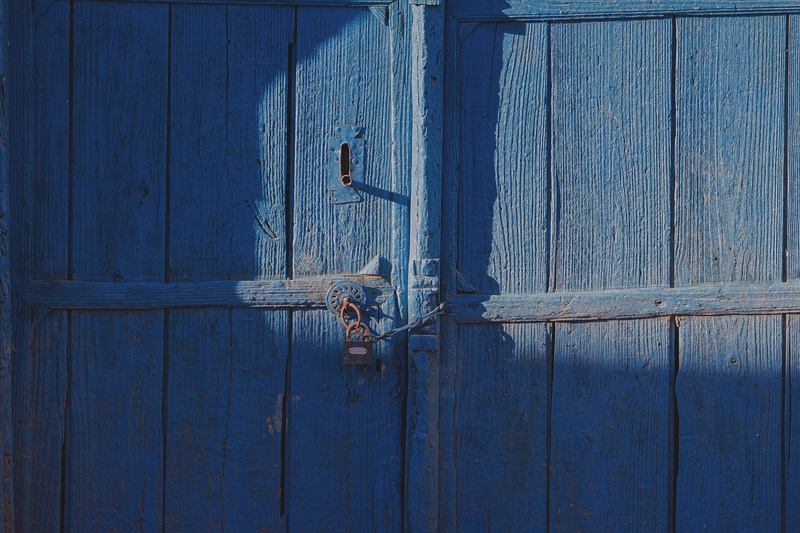 If you're an advertiser, you get access to a more specific and selective audience. In addition to or in lieu of paywalls, a common tactic is to place “advertisements” for your other content where native ads would otherwise appear. Many publishers and even blogs have adopted this method for a better user experience. 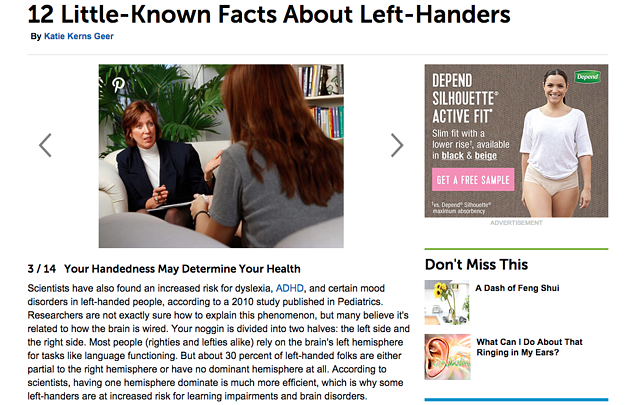 Everydayhealth.com utilizes this strategy by using a combination of paid ads and content promotions in its blog's side panel. According to marketing body Thinkbox, “the total weekly reach of TV for adults was 95% in December, with commercial [television’s] share of linear viewing at 66.3%.” If you’re trying to reach a massive audience, TV might be your best bet. No, we're not saying to run a commercial during the Dancing with the Stars finale. We're still talking digital. Capitalizing on current trends, sporting events, and popular shows to create high-quality, relevant advertisements and social posts can be a huge win for your ad strategy. A very clear understanding of who your ads will reach is paramount to this play. Regardless of your opinion on ad blockers, their popularity amongst consumers and overall intelligence is hard to ignore. Marketers have built a systemic problem that needs solving; ads are cumbersome and people are tuning them out. But this isn’t an omen! It’s an opportunity for brands who have a story and brand worth talking about to take center stage. Whether you decide to spend your budget on social media, TV, podcasts, radio, or even billboards, ask yourself if what you’re putting out there is worth paying attention to - or better yet, worth acting on.